Nxai Pan National Park was once part of the great lake that covered central Botswana, which included The Okavango Delta, Makgadikgadi and Lake Ngami. The area is covered in by grassland and clusters of acacia trees and mopane woodland. Nxai Pan is well known for its huge springbok population and once the rains have started, gemsbok, elephant and zebras migrate to the region. Large herds of giraffe can also be seen with up to 30 in a group. These all attract many predators, including lion, cheetah, jackal, leopard and wild dog. The camp opened in February 2009 and has 9 guest rooms including a 2-bedroom family unit sleeping up to four people. Rooms are spacious and feature an indoor sitting area as well as a veranda with views of the permanent waterhole. Each room has an en-suite bathroom with a shower plus an outdoor shower. The central area consists of an open-fronted dining room and lounge with an honesty bar. There are canvas blinds which can be rolled down if necessary. This area leads out to the large viewing deck and campfire which face the waterhole, frequented by elephants. To one side there is a small swimming pool and deck, complete with sunloungers. During your stay you can enjoy game drives in open 4x4 vehicles and guided walks with local bushman trackers which offer an insight into life in the Kalahari Desert. Full day trips to the famous Baines Baobabs are popular. Days at Nxai Pan usually end around the campfire as you sip a nightcap, enjoy stories and do some star gazing. Open: Nxai Pan is open all year apart from the month of June. It first opened in 2009. Location: Nxai Pan National Park, north east of the Makgadikgadi Pans in north eastern Botswana. It is the only permanent camp in the national park. The camp is by a permanent waterhole. Rooms: There are 9 en-suite guest rooms including a family room with a second bedroom and a shared bathroom. There are twin and double bedrooms, all spacious and high ceilinged, with a sliding door that leads out to the private deck which faces the waterhole. Bedrooms include a desk and sitting area. Each en-suite bathroom has 2 hand basins and a shower, with a separate toilet and an additional open air shower. Rooms are well insulated and interiors remain at a comfortable temperature year round. Maximum guest capacity is 18. 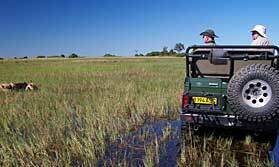 Activities: Game drives in covered 4x4 vehicles with 3 rows of seats carrying a maximum of 6 guests. Drives take place with a guide and a tracker. Guided walks are offered, led by a San bushman tracker. You can take a day trip including a picnic lunch to see Baines Baobabs. This is a great area for star gazing and the lodge has a telescope. Facilities: There is an open air lounge-dining area, a bar, large deck with a telescope and a campfire. The lodge has a gift shop. There is an outdoor swimming pool and sundeck with cushioned loungers. The camp operates on solar power. There is a laundry service. Children: Children aged 6 and over are welcome, with younger children accepted between April and October only. Families with children under 12 years are required to book a private safari vehicle. Communication: There is no internet access or mobile phone reception. "The only guest for this my first camp, but I was treated like a queen! It was lovely to have the old San bushman join us for supper one evening to later tell stories and sing a song around the campfire. I learned a very great deal here, having both guide and San tracker to myself. Whilst looking for birds we nearly ran over an exquisite young leopard just learning to fend for itself and also saw cheetahs, honey badgers and jackals, whilst 43 giraffes came to say goodbye at the airstrip!" "Excellent facilities in the rooms, which were clean and spacious. Meals were always very good and it was very kind of them to do a birthday cake the day I was there. A good view of elephants at the waterhole from the main building, plenty of snacks and complimentary water and drinks always available. From the welcome on arrival onwards, I felt really at home. Having an extra (third) night would have been well worthwhile." 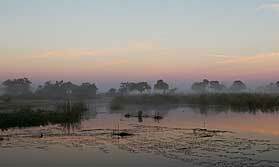 "An interesting contrast to the river, wetlands and delta environment in the semi-desert. Wildlife more difficult to spot, but Postr and Kaizer did a very good job, with interesting explanations of the flora and fauna."